Palmiers are a classic French cookie made using puff pastry (or pâte feuilletée as the French say). These are pretty fancy and impressive looking cookies given that the recipe is usually made up of only three ingredients – puff pastry, sugar and egg wash. I find palmiers always delicious but perhaps not the most exciting of cookies. In this recipe I have added some cinnamon, chocolate and pistachios to add a bit more flavour. Lay out the puff pastry on a clean work surface. Generously sprinkle the cinnamon sugar all over the surface of the pastry, ensuring the whole surface is covered with the sugar. Gently brush off any excess. With the long side of the rectangle facing you, roll the short sides of the rectangle towards each other until they meet in the middle. How tightly you roll the pastry will determine the size of the palmiers. If you want smaller cookies roll the pastry tightly; if you want larger cookies, roll the pastry more loosely. Wrap in cling film or parchment paper and chill in the refrigerator for 30 minutes. Remove the rolled pastry from the fridge and cut crosswise into slices about ⅓ of an inch in width. Lay the slices, cut side up, on the baking tray. In a small bowl, mix the egg yolk with a splash of milk or water and brush over the tops of each palmier. Sprinkle some more sugar over top of each. Bake in the oven for about 15 minutes or until the cookies are golden brown. Remove from the oven and allow the palmiers to cool for a few minutes on the baking sheet. Transfer to a wire rack to cool completely. Meantime, melt the dark chocolate over a double boiler until smooth. Fill a shallow bowl with the pistachios. Dip the cooled palmiers into the chocolate and then roll in the chopped pistachios. Place on the wire cooling rack while you repeat this process with the remaining palmiers. Once the chocolate has set, keep the palmiers in an airtight container until you’re ready to serve. 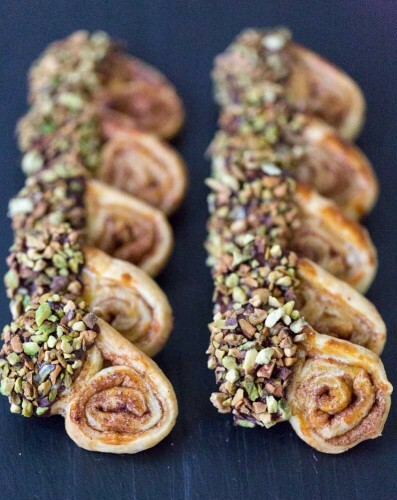 To make traditional palmiers, omit the cinnamon, chocolate and pistachios from the recipe. Keep everything else the same!